Paddle Palace is located in downtown Tigard, a suburb of Portland, Oregon. We moved to this location in 2015, after we outgrew our old building. This larger beautiful 25,000 SF building gives us more opportunity to better serve our customers. As the North American Distributor for the major brands of table tennis, Paddle Palace will continue to do our best to serve our customers with the best products and service. We are players and lovers of table tennis, dedicated to elevating the game! Paddle Palace has Everything for the Table Tennis Player. Located in Portland, Oregon USA, we offer top quality table tennis equipment, the best customer service, and great prices to players in North America and around the world. Paddle Palace is North American distributor for the best brands in the world, including Stiga, Tibhar, Nittaku, DHS, Juic, Donic, Andro, Dr Neubauer, Hallmark, Yasaka, Xiom, and Hunter. In addition, we offer the brands, Butterfly, Newgy, Kettler, Reflex Sports, Alpha Productions, and more. We sell direct to the public as well as serving as North American Distributor for the major brands. Our staff at Paddle Palace includes players and promoters of the sport of table tennis. We work hard to deserve our reputation as the table tennis company with the best customer service. We care about the sport, and we care about serving our customers and the community with consideration, fairness, and integrity. Paddle Palace is owned by Judy Hoarfrost. Judy was inducted into the USATT Hall of Fame as well as the Oregon Sports Hall of Fame. With numerous US Junior and Senior titles, Judy was a member of the US Team for ten years, and a member of the famous “Ping Pong Diplomacy” Team that made history in 1971. In the early 1970’s, her family opened a table tennis club in downtown Portland, Oregon. It was named “Paddle Palace” because of its palatial home in an historic Elks Club Building, in a ballroom with chandeliers and ornate carvings on the high ceiling. This successful full-time club was a magnet for players and teams from around the world and a center for training, leagues, and tournaments. Paddle Palace developed a computer rating system for the Pacific Northwest that became the model for the current USATT ratings system. Paddle Palace evolved from club to full-time equipment business in the late 1970’s. Paddle Palace was early to become computerized, and jumped onto the internet even before the advent of shopping-cart technology. We continue to work to employ the best technology, shipping methods, communication methods, and business practices, all with the aim of offering our customers the best possible table tennis shopping experience. While equipment sales and serving our customers is our #1 focus in business, Paddle Palace also contributes to growing the sport. 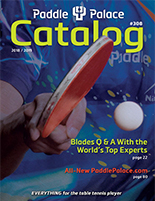 Paddle Palace is the ball sponsor for USA Table Tennis and the US Open and US Nationals, and is involved in many tournament and player sponsorships. 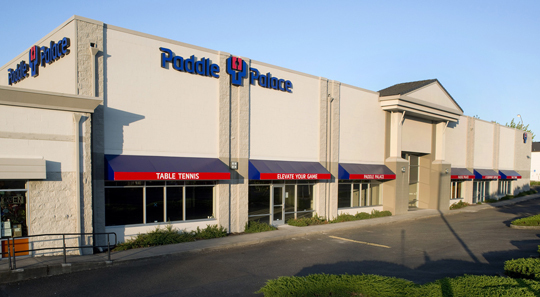 In 2016, Paddle Palace opened Paddle Palace Club, a full-time professional club located right next door to the Paddle Palace equipment company.